In our continued quest to make stuff, Audrey and I have been cutting and painting and gluing and drawing like crazy lately... But, we're a smidge desperate for some new ideas. 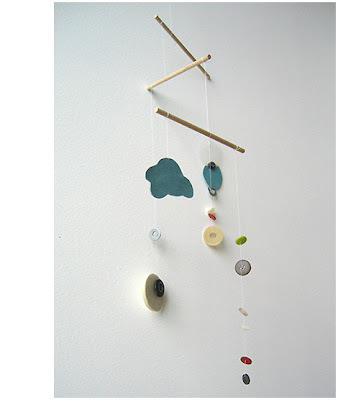 So I was psyched to find these slightly more sophisticated craft projects over on Bloesem Kids, especially the found objects mobile. It's on the list for this weekend. we're feeling crafty today over here, too...the girlies just gave all their dolls bobbed haircuts. ooooh! I have buttons... and sticks... and... stuff...! I just stumbled on your blog. LOVE IT! Very creative,and a blast to look at :)adding to favorites too! Oh, wonderful! I can't wait to see what the two of you whip up. This is fantastic. Good luck on yours.